Legacy Planning Associates wanted to stay in touch with the families they serve with a quarterly newsletter. We chose ConstantContact because of its reputation of delivering only permission-based email marketing and the ease of building contact Lists. 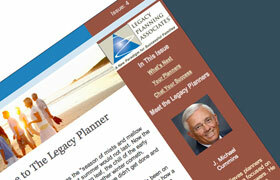 The Legacy Planner newsletter is custom-designed to match the look and feel of the website’s brand and color palette. Recipients read an article personally authored by the site’s owner. Because content is king, the Legacy Planning principals are introduced in the sidebar in a way that reminds recipients of the planners’ individual philosophies: listen, family legacies must fulfill the family spirit, and true wealth includes the human and intellectual assets of the family. A different Legacy Chat Kit is featured each quarter creating back links to the Legacy Chat website.